I remember walking around Stockholm when I had recently moved here. It was a pitch black Saturday evening in November, cold and crisp. As I approached a majestic church, I noticed that it was shimmering from the grave yard. This yellow and white light slowly flickered and cast shadows on the gravestones and the church wall. As if drawn by a magic spell, I walked up to the church and looked over the wall. The sight that met my eyes was spectacular and serene at the same time. Hundreds of candles were spread around the cemetery, decorating each of the graves. In the memory grove a bright blazing blanket of candles lit up the area. It was as if the spirits of the dead had come out to play. In Sweden, the first Saturday in November is All Saints’ Day (the Sunday after All Saints’ Day is called All Souls’ Day to separate between the saints and the dead). 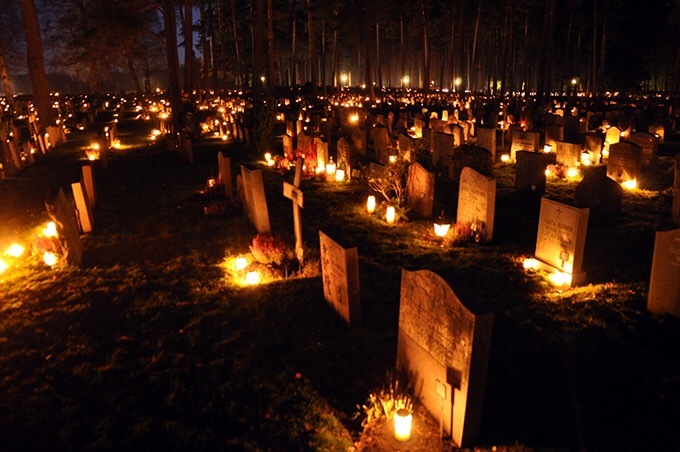 Since the 1800’s Swedes have, during this weekend, made pilgrimage to graveyards up and down the country to decorate the graves with candle light and to pay respect to the dead. It is a much more elegant and atmospheric tradition than the typical Halloween parties that otherwise have become very popular in Sweden. It is a truly beautiful experience to walk through the churchyards this weekend. In the pitch black November Nordic darkness, it is a peaceful reminder of those who have gone before us. So head for your nearest cemetery this weekend and, if you happen to be in Stockholm, go to the Forest graveyard (Skogskyrkogården) for a specifically spectacular experience (pictured below).